Size 140 x 100 cm. Edition of 5 pieces + 2 AP. 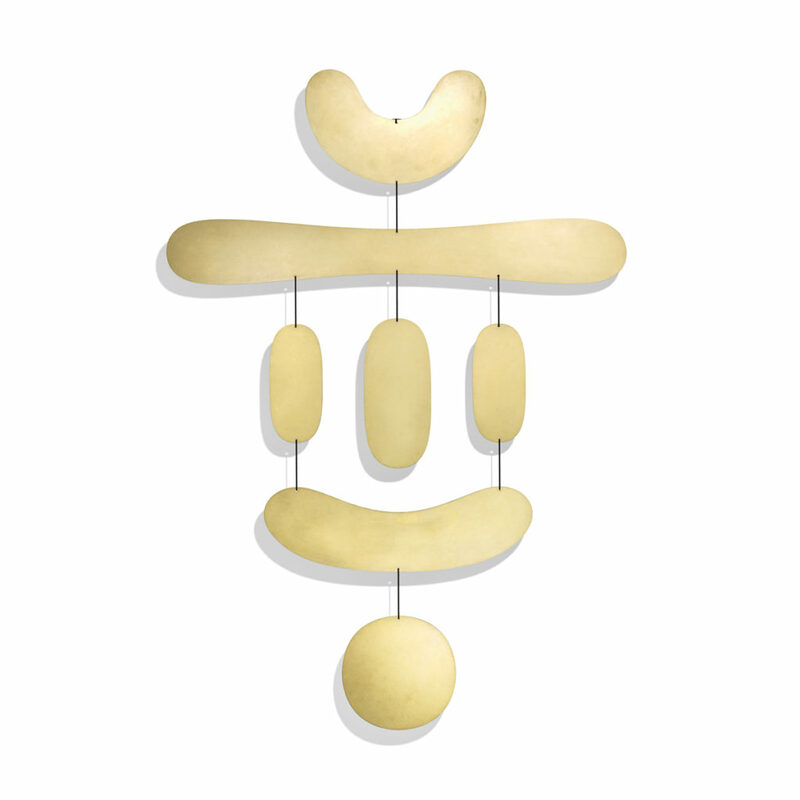 The theme of the mirror is present in a new series of wall sculptures similar to the mobile, a subject dear to many modern and contemporary artists. This work, which is slightly detached from the wall, evokes outsize jewels playing with reflections, sheen, movement and weightlessness; they are comparable to earrings whose scale the artist chooses to modify here to give them an imposing stature. This series, entitled Captromancie, refers to the presumed divinatory power of reflective surfaces – a belief that has been present throughout the history of mythologies. A glass or polished-metal mirror or an expanse of water were used then as an instrument for glimpsing into the future. Traces of this mystical art can be found in many ancient civilizations, including in Mesopotamia, Greece or some regions of sub-Saharan Africa. 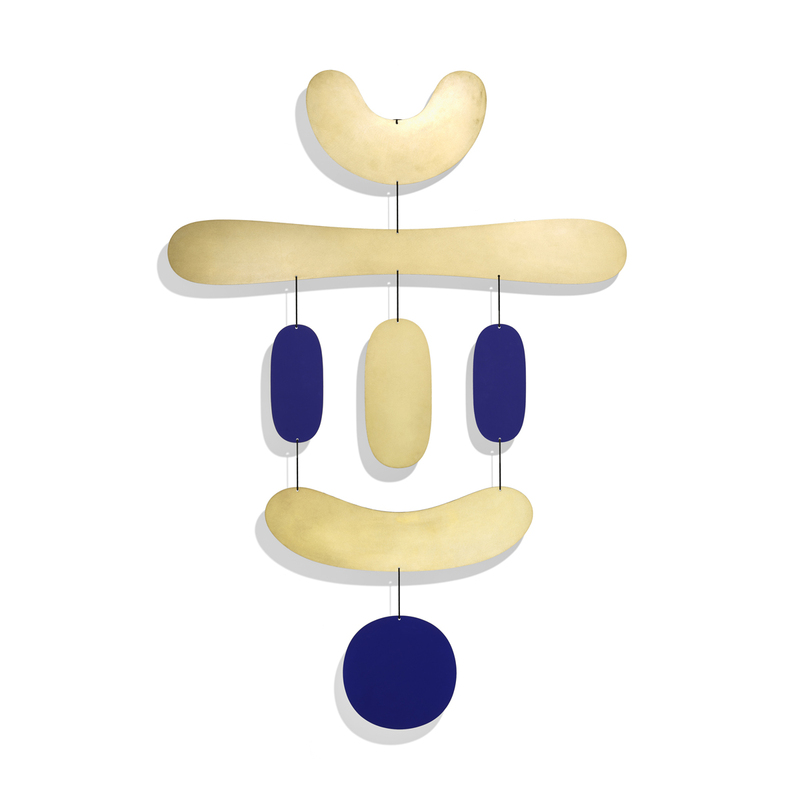 Philippe Cramer thinks of each work in the series as a broad piece of wall jewellery made up of a set of flat pieces cut out in soft and sensual shapes linked by metal hooks. Their precious appearance is created by using brass and mirror-polished stainless-steel plates. When assembled, these elements are reminiscent of archetypes of universal symbols, like pre-language pictograms. Being highly symbolic, the mirror has fascinated human beings ever since it was invented. It reflects the image of oneself and so reveals the certainty of existence but also helps to generate the optical illusions of idealization. It thus allows many levels of interpretation, or even allows one to switch to a second reality. Many artists, from Lewis Caroll to Pistoletto, have used the metaphor of the mirror to describe facets of their universe that is difficult to access with more prosaic methods of artistic expression. The mirror also enables the artist to involve the observer as a participant in the work of art and thus to render it alive and intimate. Each piece in the series is made in an edition of 5 pieces and 2 artist’s proofs, which are numbered, dated and signed by the artist.